I’ve just come back from a week long, 1,800 km (1,100 mile) road trip around Isaan, Thailand’s north eastern region. The area is a high plateau made of sandstone, which has now crumbled to form a thin, red soil from which peasant farmers try to eke a living. Often the rains fail, leaving the farmers without crops or money. It is one of Thailand’s poorest regions. It is also the home of most of the bar girls and many of the taxi drivers working in Bangkok. Whilst most of the homes here are wooden huts on stilts or soulless concrete blocks, there is the occasional larger house, possibly built with the money from a farang who fell in love with a girl from Isaan. The driving varied greatly. In places the roads were badly potholed, making travelling a bone-shaking experience. Elsewhere they were broad and fast, and almost traffic free. The cynic in me made me wonder whether these roads had been built to make someone powerful and corrupt powerful, corrupt and rich. For the most port, the roads were very straight, making overtaking easy (and very necessary given the number of slow agricultural vehicles and other lorries on the road) – though heat haze turned the far road into a silvery pool, making it difficult to discern what was happening in the distance. The landscape was mostly flat or gently undulating and dominated by paddy fields, though in a few places I passed through heavily forested mountains, and also drove alongside the mighty Mekhong, and could see the mountains of Laos on the far side washed grey by the haze. Isaan is famed for its spicy food: som tam (green papaya salad), laap (a fiery salad with ground meat) and simple grilled meats accompanied by sticky rice. However, on seeing farang customers the chillies seemed mysteriously to disappear, leaving bland, characterless food. The following Postcards describe some of my more memorable experiences in Isaan. I broke the long drive from Khon Kaen (a large, bustling city with a terrible traffic problem) back to Ayutthaya with a stop at the town of Phimai, famous for its Khmer temple, Prasat Hin Phimai. Unlike the other Khmer temples I visited on this trip, this one is in the middle of town, surrounded on all sides by busy, shop-lined streets. 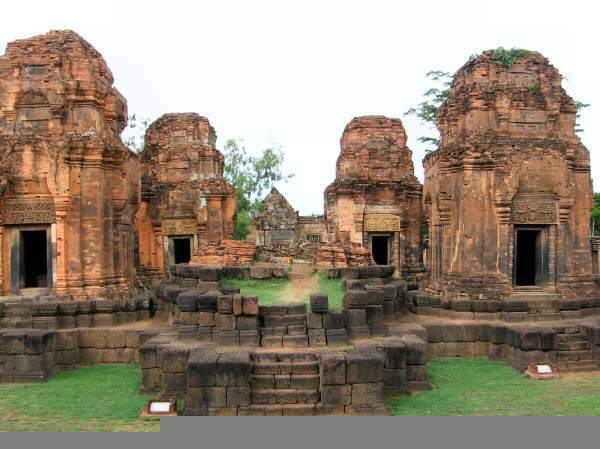 The format of the temple is very similar to the other Khmer temples I visited: an approach which passes over ponds and through smaller, cruciform buildings before entering the walled enclosure around the sanctuary building. This temple was also different because it had Mahayana Buddhist features, as well as the more usual Hindu ones. 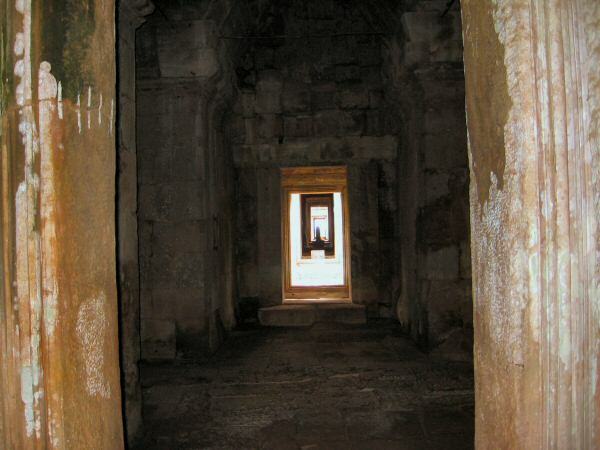 As one moves towards the Laos border the Lao influence becomes obvious, most notably in the temple design. 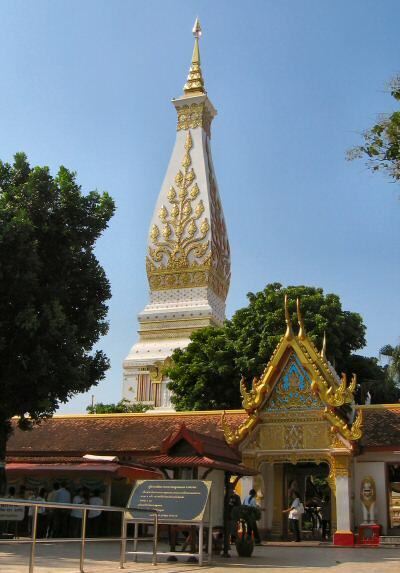 And of all the Lao-style temples, Wat Phra That Phanom has the largest chedi – larger even than any in Laos. Here the colour scheme is red, white and gold. As I arrived there was a procession of a few hundred worshippers who’d arrived in coaches. They passed three times around the chedi clutching burning incense sticks and lotus buds before kneeling and praying. After visiting the temple, I went to the temple museum where I was approached by a novice monk, 20 years old. He’d been a novice for 8 years. I wondered what had happened in his life that he had left home at such a young age. Poverty is the usual answer, or an alcoholic parent, or parental abuse. Temples provide a useful refuge for desperate boys – but there’s nothing for the girls. This novice’s dream was to become a monk and to live in a famous Thai temple in London. He was therefore keen to practise his English. And the temple does provide English lessons to novices and to monks who wish to study. 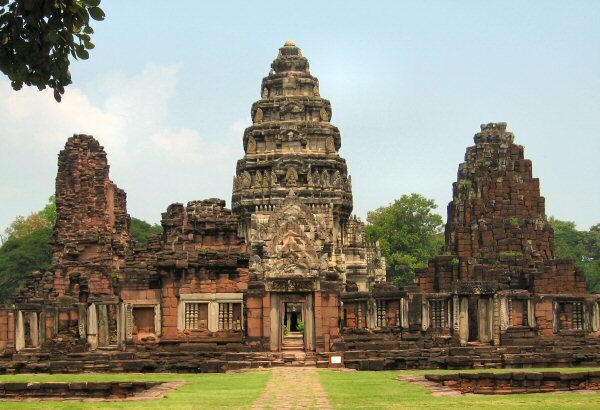 Khao Phra Wiharn might be the most impressive Khmer monument in Thailand. 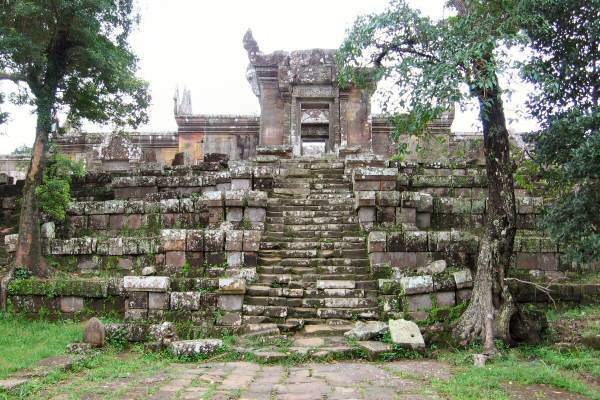 It’s an Angkor period temple complex dramatically perched on the edge of a 600m high cliff on the rim of the Khorat plateau. It might be, but it is is not. Despite its being virtually inaccessible from the Cambodian interior, the World Court decided in 1963 that the land on which it stands is part of Cambodia. This is still a cause of resentment in Thailand, and a matter of sensitivity with the Cambodians. When, about 3 years ago, a popular Thai chanteuse suggested that it was really Thai, there was rioting in Cambodia. Anyway, after an early start, I arrived at the Thai/Cambodian border at 7:30, only to find that the border doesn’t open until 8 a.m.. That gave me time to walk to the edge of a cliff facing Khao Phra Wiharn, from which good gives of the temple are to be had … provided it’s not misty. All I could see was a thick bank of fog. Just before 8 a.m. I returned to the border crosspoint. On the far side I could see a group of people waiting to cross into Thailand – stallholders for the row of souvenir stalls lining the border car park for the most part. It’s about 1 km from the border to the start of the approach to the temple. 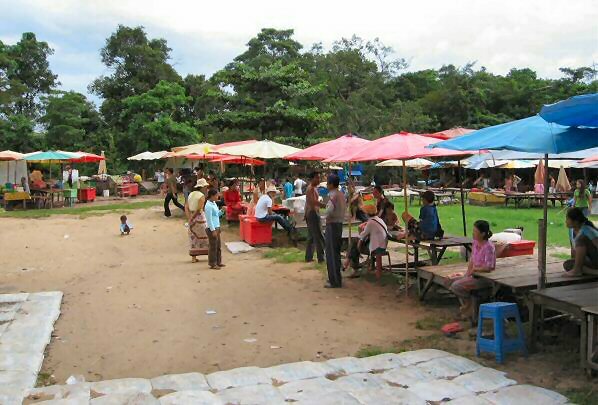 First one passes through a small market selling cold drinks, bowls of noodles, souvenir trinkets and duty free cigarettes and alcohol. Young children play under the stalls, care free, oblivious to the grinding poverty. Slightly older children pester visitors (of whom there was only a handful) to buy postcards. 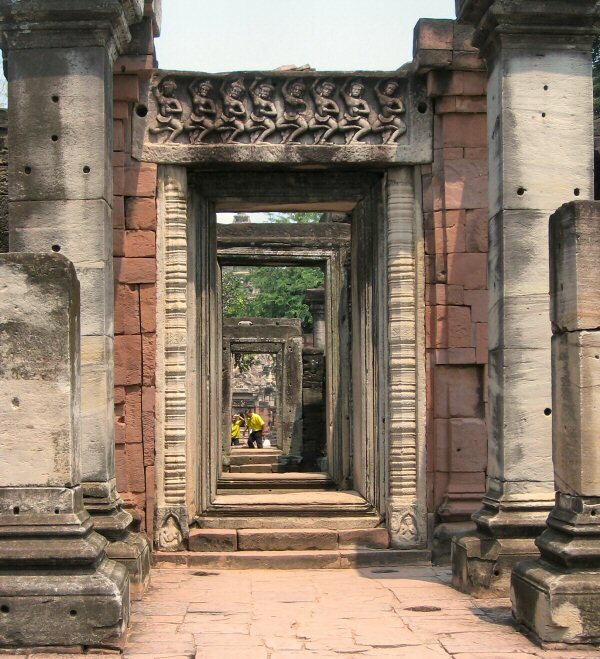 before reaching the central sanctuary, which sits in a walled compound and is surrounded by galleries. 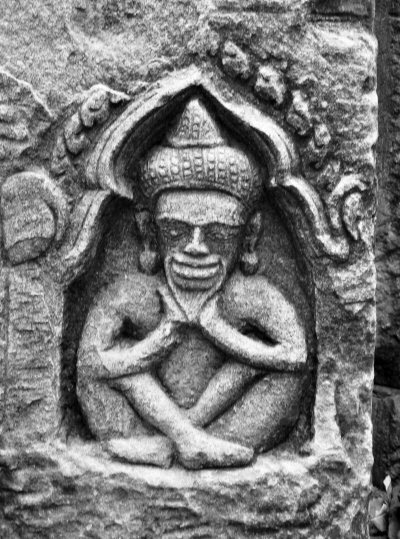 There are some nice carvings, but many are missing: stolen, lying in the piles of stone blocks which litter the site, or buried in the ground. And parts of the monument have been reduced by time to a chaotic jumble of fallen stones. 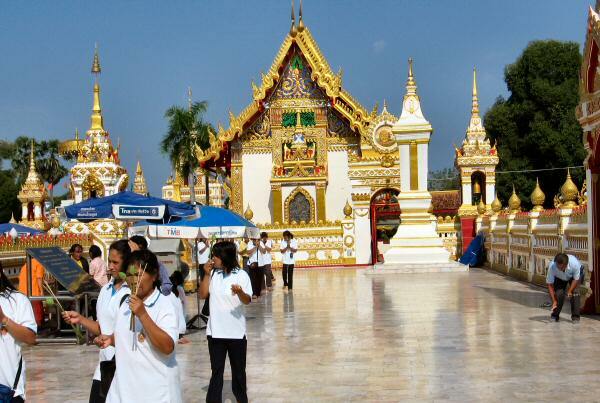 But then, not a single Baht of either admission fee goes towards the restoration of the temple. 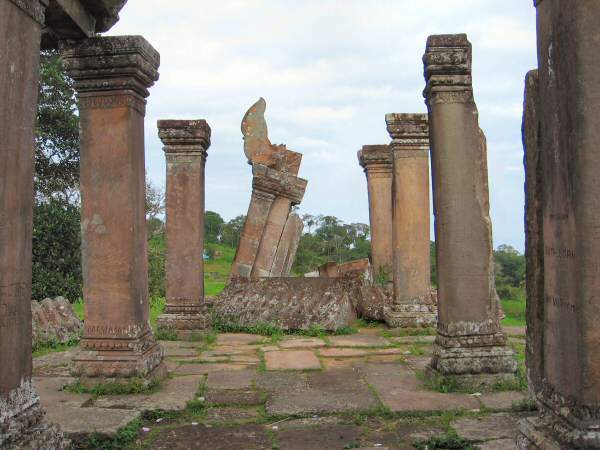 The tumbledown ruins might be romantic – a contrast to the immaculate, but slightly sterile, gardens surrounding yesterday’s temples – but the warnings of unexploded mines are less so. Whilst the complex is majestic, I’m left with a feeling of a tourist opportunity missed. 900,000 years ago the fire went out. The bright red faded to darkness, and the final puffs of smoke drifted into nothingness. The volcano that rose above the high, flat plateau was extinct. A millennium ago the land around the volcano’s base was part of the Khmer empire; the people that built mighty Angkor were here, too. 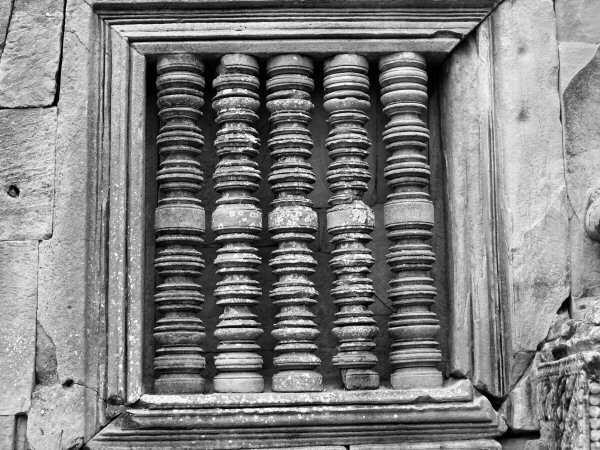 Their stonemasons carved blocks of stone to build temples, libraries, resting houses. They fashioned ornate lintels with elaborate scenes from Hindu Mythology: gods and demons in perpetual struggle. When the masons had put down their tools, the worshippers came. They walked up the long promenade made from laterite blocks and lined with short columns topped with stylised lotus buds. 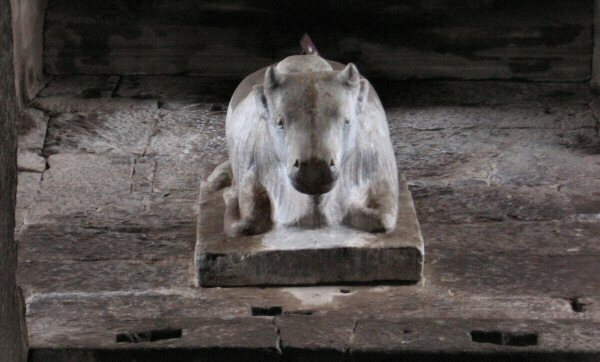 and a statue of Nandi, the bull chariot of Shiva. Then, at the very heart of the temple, they saw the Shiva lingam and yoni (stylised male and female reproductive organs). Priests would pour offerings of oil and milk which would run over the stone phallus onto the receptive womanly parts. And today I stepped in the footsteps of these ancient worshippers. 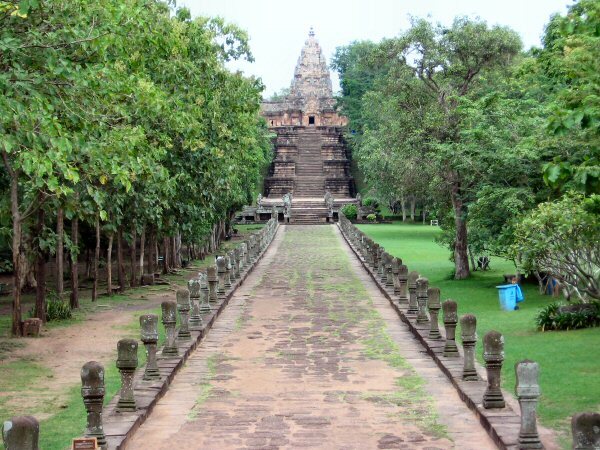 Phanom Rung was built at the same time as the earliest temples around Angkor. The quality of the craftsmanship is equal to all but the very finest of work in Cambodia, and the scale of the temple is impressive. However, unlike the temples around Angkor, this temple was deserted – not a single other tourist on the entire site, just a few gardeners sweeping away a scattering of fallen leaves. On the plain below Phanom Rung there is a number of smaller Khmer temples. 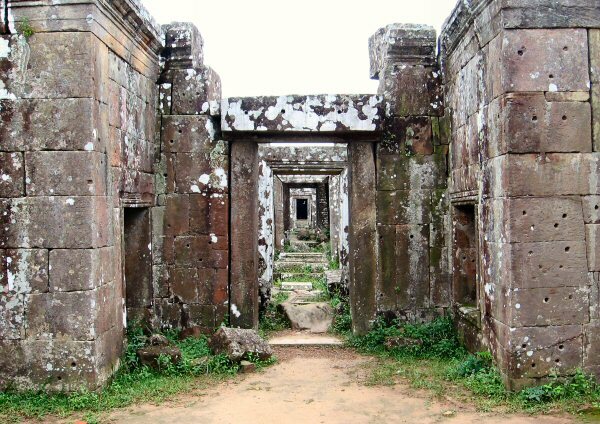 I only visited one, Prasat Meuang Tam. It dates from the 10th century C.E. And features a cluster of prasats, the largest of which is now a pile of rubble, inside a laterite boundary wall. There are also formal L-shaped ponds around the corners of the temple. 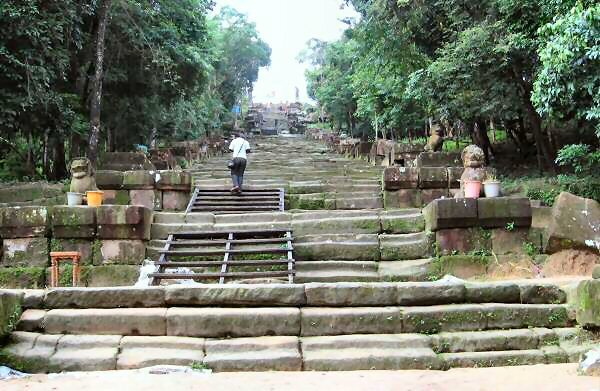 The bridges that crossed the moat outside the temple (now dry) are long gone, as is the Khmer empire that built them. 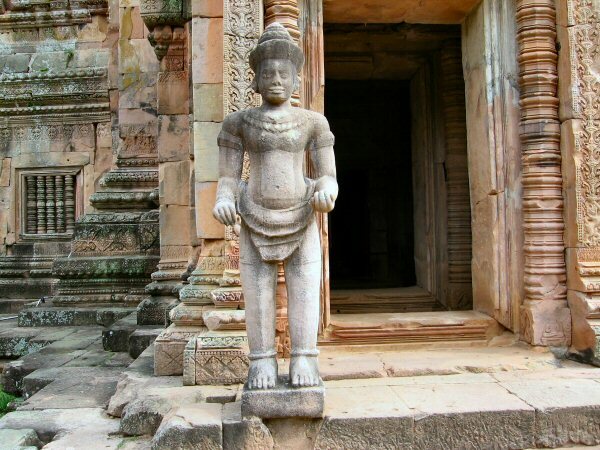 The Siamese swept across the plateau and on even to Angkor itself, which they sacked in 1431 C.E., bringing back the statues, bronzes, architecture and dancing girls to enrich Thai culture. And the Khmer empire was no more. © 2011 Postcards from Thailand. All rights reserved.